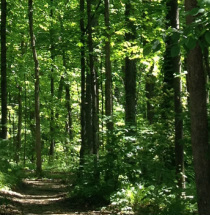 The Trees Trail Challenge will be held at Franke Park behind the Fort Wayne's Children's Zoo. The Franke Park trails are considered to offer some of the best and most beautiful single-track mountain biking in Northern Indiana. These multi-use trails are not only frequented by the Mountain Bike (MTB) community - but runners, cross country teams, hikers and families enjoy these trails every day, year round. The race is a 4-mile distance with a 2-mile option. The Start/Finish and Race Expo will be adjacent to Pavillion One near the Zoo Entrance. Runners will start by running up the road next to Shoaff Lake and at the top of the hill enter the trail to the right at the East Loop trailhead (square box near Trailhead Sign, map below). The well-marked course will follow the Mid Loop in reverse. After the switchbacks along the creek at Silver Spoon and at approximately the one mile mark, the trail empties into a grassy area and proceeds up and over Derby Hill and back into the trees at Twin Oak and Deer Alley, meandering along Spy Run Creek (where a quick splash on a hot day is welcome). The trail exits the trees again at the Derby Hill parking area and the two mile Aid Station (water and sports drink will be available). Proceeding back into the trees, two-mile participants will be routed out and through the BMX parking area and down the hill they started on to the finish area. 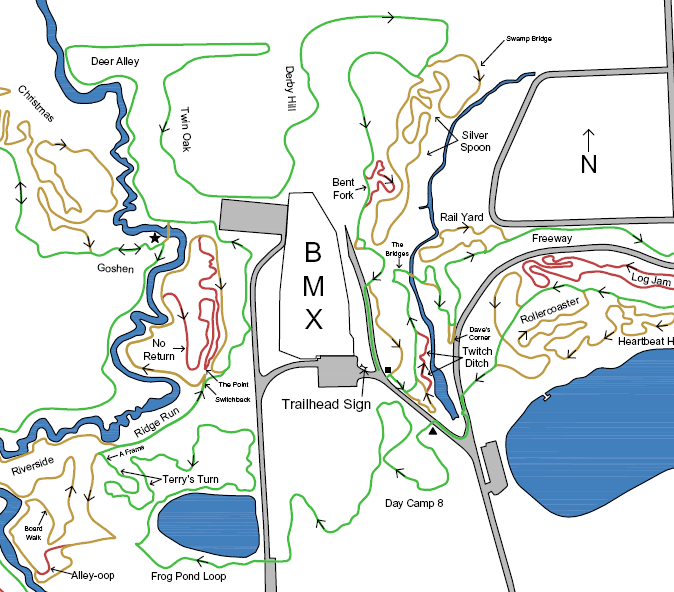 Four-mile participants will continue through the switchbacks next to the Creek, down Ridge Run and through the beautiful Terry's Turn area, around Frog Pond, over the service road, through the Day Camp 8 area and exit at the Mid Loop entrance (black triangle below). Turning right, runners will proceed down the road they started on to the Finish area and timing mats. A full service aid station will be available to all participants (individual and family) with water, sports drink and post-race fruit and food items. The Franke Park Trail System is a series of multi-use trails open to bikes, runners and walkers alike (no equestrian access). The trail is frequented by everyone from endurance athletes to cross country teams to dog walkers to bird watchers year-round. The proximity of the Fort Wayne Children's Zoo, Follinger Theatre and Franke Park (picnicking, playgrounds and pavilions) makes it an ideal spot to enjoy a hike of nearly any distance and challenge level, with the thick canopy and colors offering a beautiful experience with nature. We hope you will join us and enjoy these beautiful trails during the fall color change and return to them many times to come, on bike or on foot.